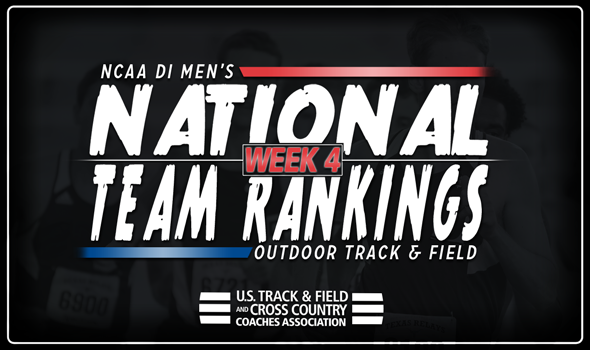 NEW ORLEANS – The top-10 of the NCAA Division I Men’s Outdoor Track & Field National Team Rankings looks completely different from Week 3 to Week 4. That’s because preseason marks – outside of those in the 5000, 10000 and combined events – were removed from consideration and only marks from the current season can be calculated. Florida and Texas Tech are still No. 1 and No. 2, respectively, while Alabama, Texas A&M and Georgia round out the top-5. Houston, Florida State, BYU, Southern California and Oregon come in sixth through 10th. The Red Raiders gained a little bit of ground on the Gators this past weekend thanks to Divine Oduduru and the efforts of their 4×400 team. Oduduru clocked the sixth fastest time in the 100 on the Descending Order List and helped Texas Tech’s 4×400 team land the No. 3 mark. The Crimson Tide vaulted five spots from No. 8 to No. 3 and matched their best ranking in program history. Alabama has eight marks that are ranked in the top-10 nationally, including four in the top-5: Ruebin Walters in the 110 hurdles (No. 2), Vincent Kiprop and Gilbert Kigen in the 10000 (No. 3 and No. 4, respectively) and Shelby McEwen in the high jump (No. 4). The Seminoles found their way inside the top-10 for the first time since 2015. Florida State is led by Austin Droogsma, Andre Ewers and Armani Wallace. This past weekend it was Wallace who bounded to the No. 4 mark on the Descending Order List in the triple jump with his mark of 16.25m (53-3¾). The Cougars are clearing their own hurdles as they’re back in the top-10 for the first time since 2014. BYU can thank its armada of steeplechasers, led by Matt Owens and Daniel Carney who are No. 2 and No. 4 on the Descending Order List – not to mention Jacob Heslington (No. 7) and Clayson Shumway (No. 10). Further down in the rankings, three teams jumped more than 10 spots into the top-20: Illinois from No. 34 to No. 17, North Carolina A&T from No. 30 to a program record No. 18 and Ole Miss from No. 37 to No. 19. The Aggies were boosted by Jaylan Mitchell (No. 1 in the 100) and Michael Dickson and Todd Townsend, who are No. 5 and No. 9 in the 110 hurdles. Be sure to check back next week as these rankings should change even more following a busy weekend that features Arkansas’ National Relay Championships, the Drake Relays and the Penn Relays. Don’t forget that the 2018 NCAA Division I Outdoor Track & Field Championships will be held June 6-9 in Eugene, Oregon.